This article, first published on GR in August 2015, tells us the trail of media disinformation by US government apparatuses. It has been verified by a source who claims she was there that then-CIA Director William Casey did in fact say the controversial and often-disputed line “We’ll know our disinformation program is complete when everything the American public believes is false,” reportedly in 1981. Despite Casey being under investigation by Congress for being involved in a major disinformation plot involving the overthrow of Libya’s Qaddafi in 1981, and despite Casey arguing on the record that the CIA should have a legal right to spread disinformation via the mainstream news that same year, this quote continues to be argued by people who weren’t there and apparently cannot believe a CIA Director would ever say such a thing. But spreading disinfo is precisely what the CIA would — and did — do. This 1975 clip of testimony given during a House Intelligence Committee hearing has the agency admitting on record that the CIA creates and uses disinformation against the American people. “I thought that it was a matter of real concern that planted stories intended to serve a national purpose abroad came home and were circulated here and believed here because this would mean that the CIA could manipulate the news in the United States by channeling it through some foreign country,” Democratic Idaho Senator Frank Church said at a press conference surrounding the hearing. Church chaired the Church Committee, a precursor to the Senate Intelligence Committee, which was responsible for investigating illegal intelligence gathering by the NSA, CIA and FBI. 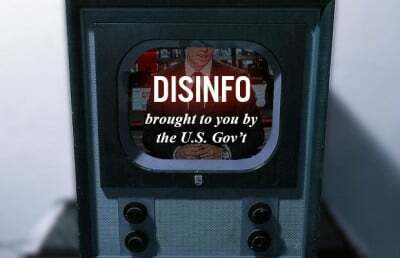 This exact tactic — planting disinformation in foreign media outlets so the disinfo would knowingly surface in the United States as a way of circumventing the rules on domestic operations — was specifically argued for as being legal simply because it did not originate on U.S. soil by none other than CIA Director William Casey in 1981. 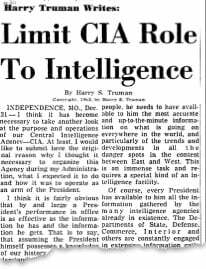 Former President Harry S. Truman, who oversaw the creation of the CIA in 1947 when he signed the National Security Act, later wrote that he never intended the CIA for more than intelligence gathering. “I never had any thought that when I set up the CIA that it would be injected into peacetime cloak and dagger operations,” Truman penned in 1963 a year after the disastrous CIA Bay of Pigs operation.